ACS is committed to developing products that not only make a difference in everyday life by providing security and convenience, but also contribute to global efforts in environmental care and sustainability. Compliant with stringent standards, ACS products are guaranteed safe for both users and the environment. ACS seeks to reduce substances that may be harmful to the earth and human health. Since 2006, all ACS products in the market, including smart card and smart card readers, have been compliant with the requirements laid down in the directive restricting the use of certain hazardous substances in electrical and electronic equipment, commonly referred to as the Restriction of Hazardous Substances (RoHS) Directive. This directive restricts the use of six hazardous materials in manufacturing various types of electronic and electrical equipment. It covers all domestically made and imported products in the EU, with a few exemptions given on certain occasions. Since 2009, we have also been taking steps to comply with the EU's new regulation on the registration, evaluation, authorization and restriction of chemical substances, more commonly known as REACH. REACH aims to improve the protection of human health and the environment through better and earlier identification of the intrinsic properties of chemical substances. The benefits of the REACH system are expected to come gradually, with more substances increasingly being phased into REACH. Aside from eliminating hazardous substances from our manufacturing process, we have also taken on the task of recovering and recycling smart card readers worldwide. Guided by the RoHS Directive 2002/96/EC, also known as the directive on Waste Electrical and Electronic Equipment (WEEE), we have partnered with a local institution to fulfill product take-back obligations. The WEEE directive lays down the legitimate treatment for recovering and recycling electronic waste; it aims to reduce the environmental impact of companies, which are in the business of producing and deploying electric and electronic products. This is another way for us to uphold our commitment to reduce the environmental impacts brought about by the disposal of electrical and electronic equipment , thus benefitting our customers and the environment. ACS recognizes its share in the global responsibility to make the world a better place. We answer this call primarily by developing revolutionary products that gradually improve how we live and do things. But we don’t stop there. Rather, we actively reach out to people through community programs and volunteer services. This is a serious commitment we have undertaken, and we intend to enlarge our efforts in the coming years. ACS values how community service contributes to the wellbeing of our employees, by promoting their selflessness, and respect and responsibility for others. To foster a positive relationship with the communities in which we operate, ACS organizes and participates in various volunteering projects around the world. Since 1995, over 50 percent of ACS employees have taken part in volunteering activities, to give back to the communities that have helped us flourish. Giving back to the community is central to the ACS philosophy. We regularly provide financial assistance to community organizations responding to the needs of impoverished and suffering people. To find out how ACS could help non-profit organizations, please contact [email protected]. We are in the business of providing products that promise utmost security and convenience to our clients and their end customers. As such, the nature of our business requires the highest degree of accuracy, precision and quality in developing our products. To bolster our efforts in quality assurance, we undergo stringent certification programs from unbiased organizations that enforce industry standards. This is our way of ensuring we deliver only the best products to the market, and maintaining our outstanding track record in the smart card industry. 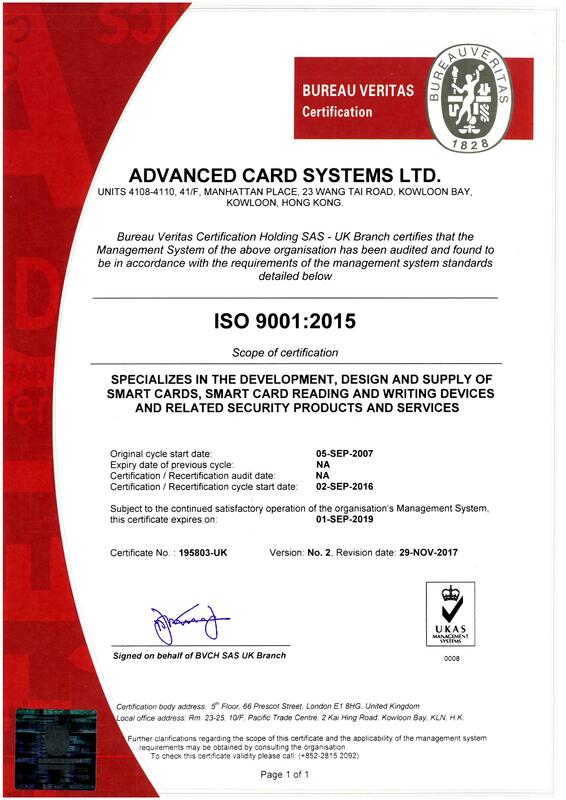 ACS got its first ISO certification in 2007, having proven successful in following the requirements set by ISO 9001 standard. It undergoes annual audits done by an accredited third-party auditor. ACS further improves the level of satisfaction it delivers to customers by carrying out business operations based on the Quality Policy and Quality Control Manual. ACS is compliant with labor laws and regulations in the countries where it has offices. In addition, our company conducts not only in-house trainings, covering soft skills, technology, industry information, and others; but also regular activities such as company dinners, team-building activities, and so forth, that serve as avenues for well-rounded development. These inspire and motivate employees, and encourage socialization. ACS also encourages employees to obtain training outside the company and further study to help them perform their duties more effectively .